A popular east-Asian trend, the cat café is having a moment. 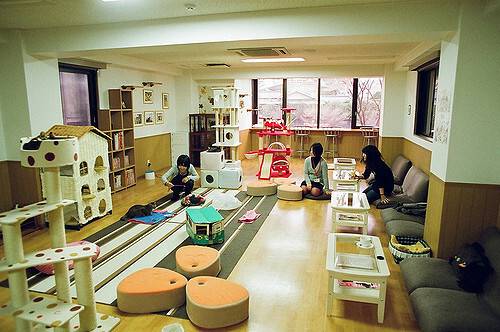 In 1998, the first ever cat café opened in Taipei, Taiwan; the Cat Flower Garden proved to be so successful that the trend spread to Japan, then China, then—with help from the Internet—went global. The cat café’s overwhelming commercial success makes us believe that, despite potential logistical complications, dog and puppy cafés are next on the list of trendy destinations. Despite the superficial success of cat cafés, animal charities are divided on whether or not the animals benefit from the model. Keeping several animals in a confined space is never a good idea and adding a consistently-rotating set of humans to the mix can be downright stressful. Though some animals may be suited to (and even enjoy!) this level of attention, most—especially animals with difficult and traumatic backgrounds—will have a poor reaction. Furthermore, the only requirements imposed on cat cafés regard food safety, meaning that individual shops set their own animal welfare standards. The unacceptable practice can create a traumatic environment for the animal, further decreasing their chance of being adopted. Moreover, an animal café operates more like a petting zoo than an adoption center. Adoption rates within cat cafés are disastrously low; unsurprisingly, visitors see the experience as a fun, recreational activity rather than a serious attempt at adopting an animal. Though some may view the café as a place to socialize with animals prior to adoption, this is rarely the case. Before turning your shelter into a café-like destination, consider the benefits and drawbacks of the model. Sure, it might bring more people through the door, but your adoption frequency will (likely) not change. The stress caused to animals by the environment is unnecessary.